Blade length :　23.9　cm or 9.40 inches. Sori : 0 cm or 0 inches. Width at the hamachi : 2.49 cm or 0.98 inches. Shape : regular size, thick Tanto. There are Bo-Hi and double-Hi on the blade. Hamon : Nioi Deki, Suguha and Choji Midare. Boshi is round Yakisage shape. of Yokoyama Sukemori and also is the brother in law of Yokoyama Sukenaga. He studied by his master Sukenaga. The unique choji midare was invented by his mentor Sukenaga. Later on it was rated highly as unique Yokoyama school hamon. The gorgeous Jyukka Choji midare is one of the most beloved sword of the sword fans. on the back side Tomonari 58th generation means Tomonari Bizen tradition. Yokoyama school first generation Yokoyama Sukenaga made original Cyojimidare hamon and succeeded next generation Sukekane. 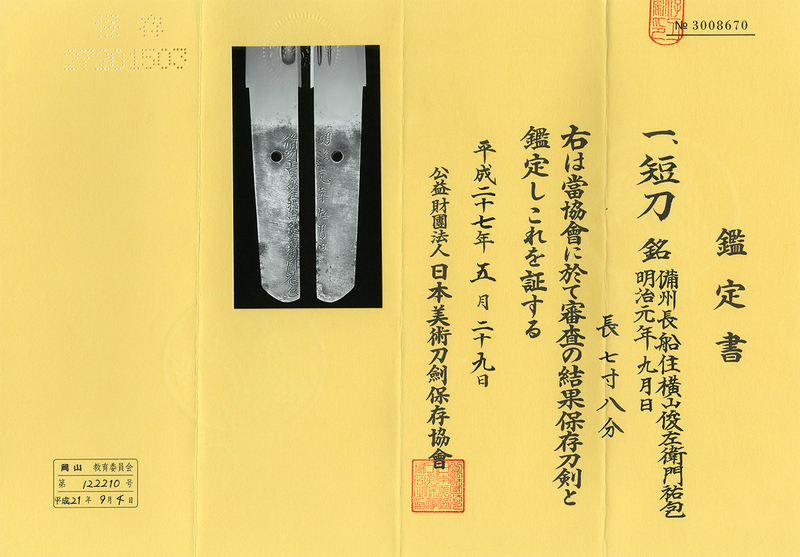 The blade is typical Bizen blade. We recommend this nice sword for you.